We are a growth and customer – oriented company. We are industry leaders focused on the highest standards in safety. Our personnel offer an exemplary standard gained from years of experience learning in the most valuable place – in the field. that comes from knowing they are receiving the very highest standard of professionalism and attention to detail. Bravo Target Safety’s commitment to excellence extends to providing skilled Health, Safety, and Environmental Inspection and Audit Personnel, including Canadian Registered Safety Professionals (CRSP), Construction Safety Officers (CSO), and additional personnel such as Rescue and Security Teams, all highly experienced in specialized field operations. Our highly trained personnel provide a wide range of skills for all aspects of H2S Protection, Confined Space Entry, High Angle Rescue, Safety Supervision, and Project Safety Coordination. Our team of over 500 safety personnel provides exemplary service for various needs and industrial settings including safety coordination, planning, turnaround and construction projects, and day-to-day field operations. We maintain and operate under strict Codes of Practice and provide leadership and expertise to you and your team, on and off site. We maintain a complete inventory of safety equipment for on-site use and rental purposes. 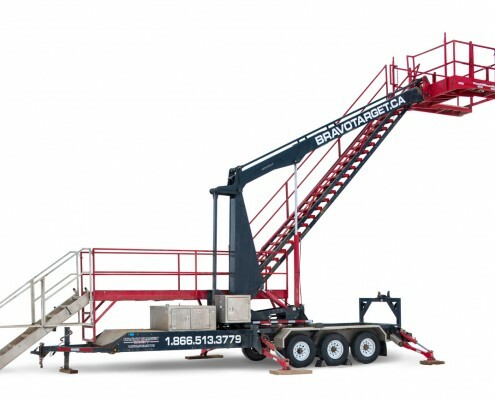 We incorporate and apply new technology to our systems and provide first class equipment in our rental equipment fleet. Certified Technicians conduct regular inspections and function testing to ensure equipment safety. Technicians ensure all quality control requirements of the Manufacturer and the Government are met. These are small, portable gas monitors designed to be carried without hindering the user. Weatherproof and sturdy, these units are ideally suited for rough field conditions. 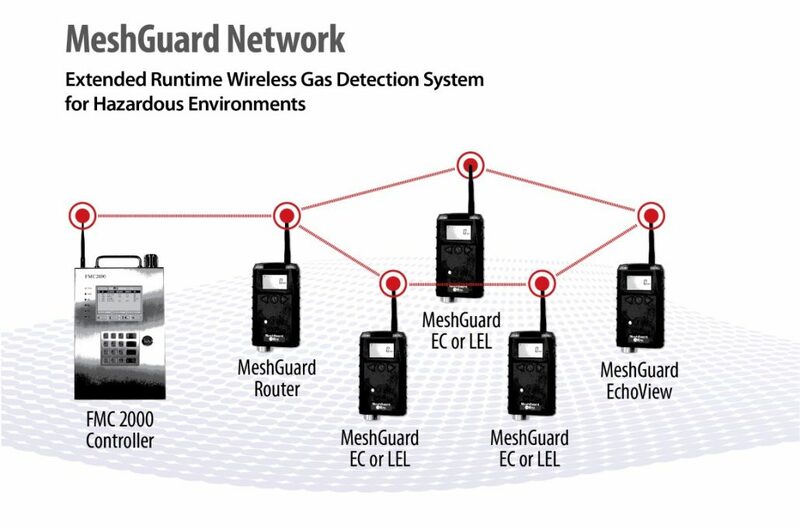 Oxygen, hydrogen sulphide, lower explosive levels, carbon monoxide, or other gases are quickly, easily, and dependably monitored and detected. A unit may be used as a single standalone detector by placing it between the hazard and the worker. Bravo Target personnel are trained specialists. They account for all personnel on location and provide orientations that outline risks, hazard mitigation and best practices tailored to each company and situation. Bravo Target Safety specialists have extensive experience in all aspects of drilling, completions, construction, turnarounds, confined space entry, and well control. Bravo Target personnel are trained specialists. They account for all personnel on location and provide orientations that outline risks, hazards, muster points, and best practices tailored to each company and situation. Bravo Target Safety employs highly trained medics of all designations to perform specific functions to support well head drilling and completions operations, facility and plant turnarounds as well as any remote event or condition. There are risks associated with working in elevated areas. Bravo Target Safety has a strong team of High Angle Rescue personnel that have the technical training, knowledge, experience, and expertise to perform rescues and provide relevant planning to help you complete high angle projects safely. Confined spaces present unique and complex risks including hazardous atmospheres and internal obstructions that make continuous work and rescue challenging. Our Rescue Technicians have received all the technical training and hands on experience to complete rescues, pre-entry plans, and hazard assessments. At Bravo Target Safety, we incorporate comprehensive training and innovative equipment systems for all potential emergencies that can arise in an industrial setting. Our team builds and assists our clients to create plans, while delivering the best quality emergency services to enhance response and to protect life. Bravo Target Safety shower trucks and trailers are designed to protect personnel and equipment from acids or other hydrocarbons during fracs or any other time these risks are present. They provide clean rooms, showers, and dirty rooms for use in decontamination. They filter the air and maintain negative pressure. The showers provide a continuous supply of hot water. All shower waste water is contained in steel tanks and then filtered to remove contamination upon discharge. All of our firefighters are highly trained to recognize potential sources of ignition and to mitigate the risks involved. At Bravo Target Safety we take pride in having one of the newest and best-equipped fleets in the industry. With CAFS (Compressed Air Foam System) units on board as well as the latest in firefighting technology, our combination units have your covered from frac day to emergency response. All of our firefighters are highly trained to recognize potential sources of ignition and to mitigate the risks involved. They are equipped and experienced in extinguishing fires quickly and effectively, ensuring the loss of property and the risk to workers is kept to a minimum. Compressed Air Foam is so effective because it truly attacks all sides of the fire tetrahedron by smothering the fire with a “uniform foam blanket,” depleting oxygen, and preventing it from combining with the fuel.CAFS Units are a truly self-contained system with absolutely no external resources needed to operate and are ready for immediate discharge. In addition to our fire/shower combination units and CAFS units, ideal for invert drilling or hot refuelling, we also have a significant inventory of dry chemical units and water pumps. 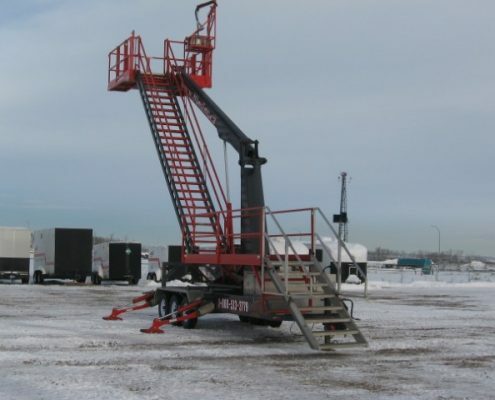 Our Mobile Elevating Platforms (MEPs) and patent pending Articulated Mobile Platforms (AMPs) are designed to increase work efficiency and decrease service costs. They enable crews to work with unprecedented safety and security at heights up to 24 feet on the well head and other applications. The self-contained power, hydraulic, and operating systems increase operating and setup flexibility for varying jobs. 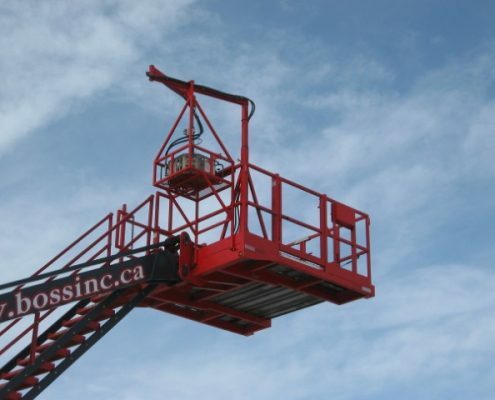 The AMP is designed to decrease costs by eliminating the need for heavy transport equipment such as pickers, loaders, and large crews to set up and establish scaffolding systems. Our efficient design reduces maintenance and ensures trouble free operation. 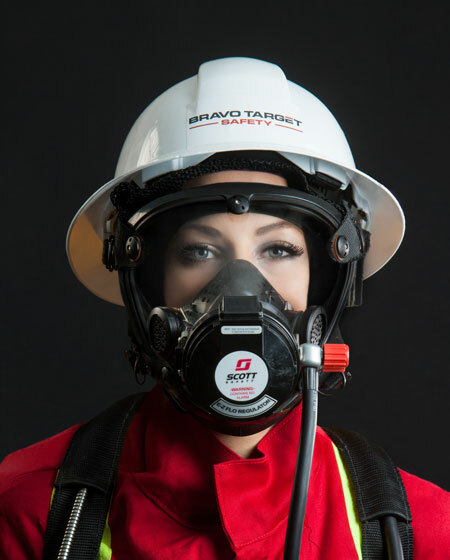 Bravo Target Safety has the specialized equipment and expertise to respond quickly and efficiently to any oilfield or industrial emergency situation in Canada. With nine operational bases in BC and Alberta, we offer an unprecedented level of service, support, and response time. 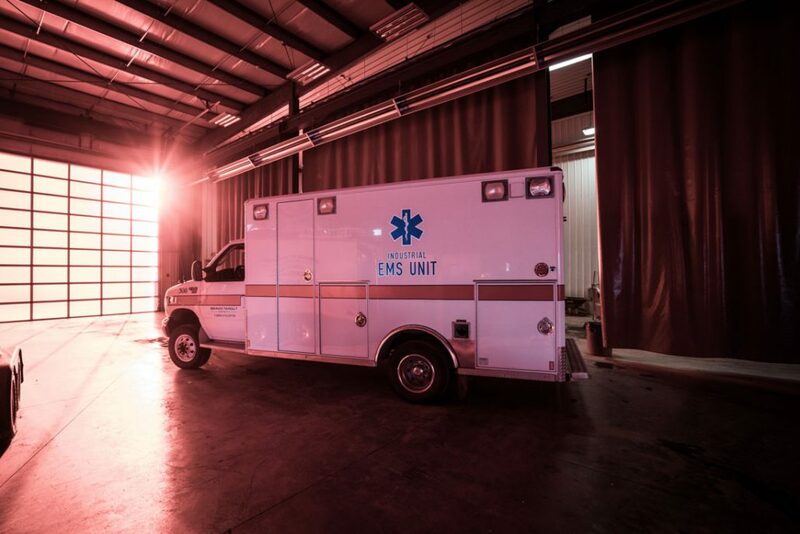 Utilizing state-of-the-art equipment, cutting edge H2S safety and medical services, and one of the newest and largest fleets of fire trucks in Western Canada, we can manage any oilfield or industrial emergency safely and efficiently. Bravo Target has the equipment and expertise to safely and efficiently perform your hot tap service requirements. From the initial project assessment, our experienced special services staff, along with our engineering support team, will consult and advise best practices right through to the implementation of the project. Safety is paramount with all hot tap operations. Bravo Target Safety has the equipment and expertise to safely and efficiently perform all your freeze service requirements. Freezing is a method of placing a temporary barrier in order to isolate or close the inside diameter of a pipe, valve, or vessel to maintain pressure control to allow for valve replacement, pipe modifications, or mechanical repairs in a safe manner. 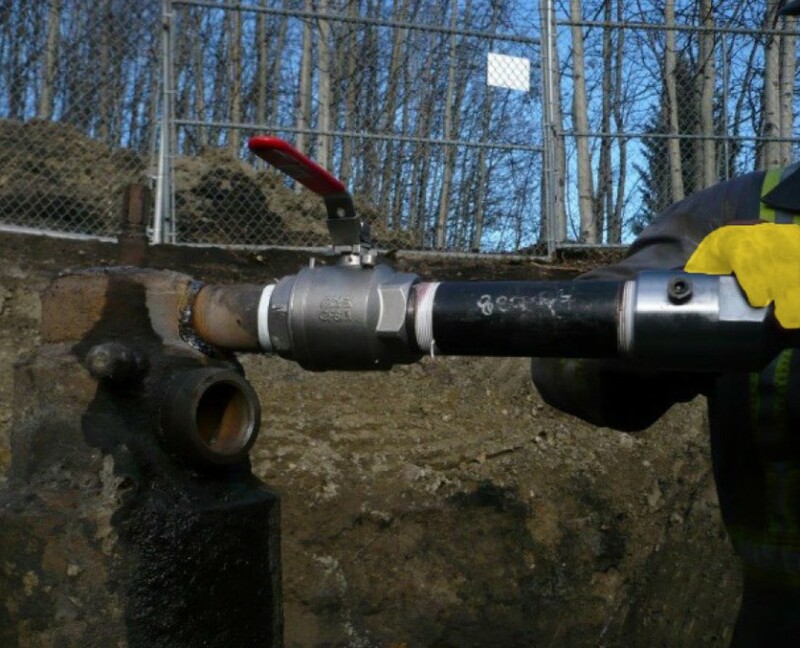 It is a safe and cost effective way to isolate and control pressure to allow maintenance without killing a well, draining a vessel, or bleeding off a pipeline. The Bravo Target Safety team has over 150 years of combined experience in well control, emergency response, and hydrocarbon firefighting in some of the harshest environments anywhere. Our experienced team of drilling and completions engineers and support staff go right to work to help minimize property loss and mitigate the risk to all involved. All of our medics are fully trained in all areas of our operations and work under the close supervision of our medical manager and medical director.